ArtisticHomeowner.com is an ecommerce site featuring wall murals and offers custom wall murals from client provided photos and artwork. 1. When did you set up your website? I registered the domain name in 2005. The original website was a push and publish site that was part of my tuition in a very expensive coaching program I had been enrolled in. I was ready to make it big on the internet! 2. What gave you the idea for this particular niche & website? It was suggested I sell products I could really get excited about. 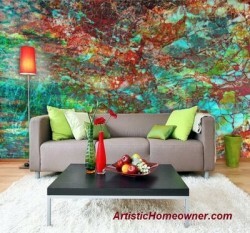 I'd always loved the idea of wall murals and thought how cool it would be to sell them. It was difficult to find vendors at first so in the beginning I mostly sold wall borders and little prints. 3. Did you have any experience with online business prior to creating this website? No, none at all. I could forward those chain emails, but that was about the extent of my technical skills. Once the coaching program was over with, so was my access to any online help for my questions and answers. It was after the coaching program was over and 13 months that my site had been live and online when I finally made my first sale. It was for about $12 and my commission from that sale was less than $4. Needless to say I was very discouraged. It was around that time that I found Clicknewz and Lynn's forum. It was as if someone threw me a lifeline. Joining the Elite Brainstorming Group was hands down one of the smartest investments I ever made. The members were always very patient and helpful with any technical issues I had. They are a such a great bunch of people! Lynn has also helped me very much giving me lots of great suggestions to increase traffic and sales to my site over the years. 4. What did you do for work prior to setting up an online business? I was and still am a Regsitered Nurse. Being that I work long hous, I often have a few days off during the week, so I definitely have the time to invest in working online. 5. How did you initially promote your website, and if different – how do you promote it now? I used spend hours and hours typing up directory submissions and doing article marketing. I submitted my site manually to hundreds of online shopping directories one by one. Since I had such a hard time with html, it took me awhile to learn how to format a text link correctly. Once I had the html down pat, then I had a hard time figuring out which anchor text to use. Often I would link to my domain name or more than one keyphrase. I still continue to do article marketing but now I also do guest blogging as well. I recently started using Facebook, Twitter, Pinteret, and other social media, and it is definitely increasing traffic to the site. 6. Is your website profitable? Can you share some basic traffic & profit stats with us? After my initial $4 commission, I was tempted to just throw in the towel. But I was urged by Lynn and the members of the forum to stay focused and keep at it. Using the input from the group, I ditched the crappy website from the coaching program and upgraded to really nice, user-friendly shopping cart solution. I got a toll free number (per Lynn's suggestion) and continued my SEO efforts. Thankfully my hard work and persistence paid off. Eventually the tides turned and sales started to roll in. I'm so proud of my site now. I make a pretty good amount of money each month. This past month (January 2012) has been my most profitable to date, so I'm obviously Very excited about that. This month I've had 74,561 pageviews and 10,712 Unique Visitors. 7. What are your plans for the site going forward? 8. What ONE piece of advice would you give someone interested in starting their own niche site or blog? Well e-commerce is great in that someone can purchase merchandise and you get paid immediately and that's wonderful. But remember that your site is not an ATM. Your customers are everything so treat them like gold. In the wall mural industry, quality is everything. I like my customers to have the best experience possible, from the minute they contact me with a great idea for their wall, to the time the mural arrives on their doorstep. I try not to rush people and make sure to answer all theri questions. I am prompt in returning emails and telephone calls. So remember, your customer is everything. Whether they are buying a small print for a dorm room or a large corporation with a huge order, treat each with utter respect and professionlism. Follow up with them. Make sure they are happy. Lisa, congratulations on your success. You are an inspiration to me! I have to give this one a thumbs up for a job well done. I understand her when she was about to throw the towel, but I'm amazed that she managed to make it big in the online business world. And I like the fact that she considers her customers as the most important part of her business equation. Again, kudos to Lisa for a job well done! Way to go on your success, Lisa! I have always loved your site and would like to one day buy my own wall mural for my home office. I think you are going to really grown your business getting out there on social media. How fun! Thanks for sharing your journey Lisa Herbik. I too was there when I just started and Lynn group has motivated. I now so good but through sharing done here I learned a lot of stuff which is difficult to find out in the market. Thanks for sharing. I LOVE Lisa's niche. I have a domain in the home decorating/lifestyle niche that was part of a project a few years ago. Unfortunately it got beyond my ability to manage and has been overrun with spam comments. I created a complementary Facebook Fan page but never promoted either the domain or the page. I haven't posted in ages and so it just sits gathering dust. Any ideas as to what I should do with it? Fix it ,kill it, revamp it. The domain name is decorativepaintingpatterns dot com. I actually LIKE most of the posts there but I am totally lost as to what to do with it. I couldn't even remember the correct domain as I left off an e at the beginning. Sorry! Good job! I like the determination of this person. Just imagine working as a registered nurse while trying your luck online could be very difficult to handle all because of the stress that you might experience as health professional. I hope we all possess that positive attitude in making a difference in our lives. Love the story of persistance paying off. I know it seems cliche but truly is the best lesson a person could ever learn.